This article is about the Irish organisation. For other uses, see Fenian (disambiguation). Fenian (/ˈfiːniən/) was an umbrella term for the Fenian Brotherhood and Irish Republican Brotherhood (IRB), fraternal organisations dedicated to the establishment of an independent Irish Republic in the 19th and early 20th centuries. Originating in Irish mythology with the Fianna, the term derives from groups of legendary warrior bands following Fionn mac Cumhail, with their associated mythological tales, known as the Fenian Cycle. The term Fenian today is seen as a derogatory sectarian term in Ireland to refer to Irish nationalists and/or Catholics, particularly in Northern Ireland. The term has been used similarly in Scotland as a slur to refer to Scottish Catholics or Scots with Irish ancestry. Fenianism (Irish: Fíníneachas), according to O'Mahony, is symbolised by two principles: firstly, that Ireland has a natural right to independence, and secondly, that this right could be won only by an armed revolution. 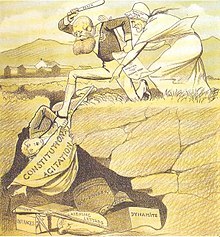 The term Fenianism was sometimes used by the [English] political establishment in the 1860s for any form of mobilisation among the Irish or those who expressed any Irish nationalist sentiments, or questioned the Protestant Ascendancy such as by advocating for the rights of tenant farmers. In this sense the term was often applied inaccurately by the political establishment to the unrelated Tenant Right League, Irish National Land League and Irish Parliamentary Party who did not advocate explicitly for an independent Irish Republic or the use of force. The establishment warned people about this perceived threat to turn what they saw as "decent civilised" society on its head by movements such as trade unionism seeking to change the existing social order in the United Kingdom. James Stephens, one of the "Men of 1848," (a participant in the 1848 revolt) had established himself in Paris, and was in correspondence with John O'Mahony in the United States and other advanced nationalists at home and abroad. This would include the Phoenix National and Literary Society, with Jeremiah O'Donovan (afterwards known as O'Donovan Rossa) among its more prominent members, which had been formed recently at Skibbereen. Along with Thomas Clarke Luby, John O'Leary and Charles Kickham he founded the Irish Republican Brotherhood on 17 March 1858 in Lombard Street, Dublin. In 1882, a breakaway IRB faction calling itself the Irish National Invincibles assassinated the British Chief Secretary for Ireland Lord Frederick Cavendish and his Permanent Under-secretary (chief civil servant), in an incident known as the Phoenix Park Murders. Fenian convicts escape from Fremantle in the 1876 Catalpa rescue. The Fenian Brotherhood, the Irish Republican Brotherhood's US branch, was founded by John O'Mahony and Michael Doheny, both of whom had been "out" (participating in the Young Irelander's rising) in 1848. In the face of nativist suspicion, it quickly established an independent existence, although it still worked to gain Irish American support for armed rebellion in Ireland. Initially, O'Mahony ran operations in the US, sending funds to Stephens and the IRB in Ireland, disagreement over O'Mahony's leadership led to the formation of two Fenian Brotherhoods in 1865. The US chapter of the movement was also sometimes referred to as the IRB. After the failed invasion of Canada, it was replaced by Clan na Gael. In Canada, Fenian is used to designate a group of Irish radicals, a.k.a. the American branch of the Fenian Brotherhood in the 1860s. They made several attempts to invade some parts of the British colonies of New Brunswick (i.e., Campobello Island) and Canada (present-day Southern Ontario and Missisquoi County), with the raids continuing after these colonies had been confederated. The ultimate goal of the Fenian raids was to hold Canada hostage and therefore be in a position to blackmail the United Kingdom to give Ireland its independence. Because of the invasion attempts, support and/or collaboration for the Fenians in Canada became very rare even among the Irish. The Battle of Ridgeway was the largest engagement of the Fenian Raids. Francis Bernard McNamee, the man who started the Fenian movement in Montreal (and who was later suspected of being a government spy), was a case in point. In public, he proclaimed his loyalty to the queen and called for an Irish militia company to defend Canada against the Fenians. In private, he wrote that the real purpose of an Irish militia company would be to assist the Fenian invasion, adding for good measure that if the government denied his request he would raise the cry of anti-Irish Catholic discrimination and bring more of his aggrieved countrymen into the Fenian Brotherhood. A suspected Fenian, Patrick J. Whelan, was hanged in Ottawa for the assassination of Irish Canadian politician, Thomas D'Arcy McGee in 1868, who had been a member of the Irish Confederation in the 1840s. The danger posed by the Fenian raids was an important element in motivating the British North America colonies to consider a more centralised defence for mutual protection which was ultimately realised through Canadian Confederation. The Fenians in England and the Empire were a major threat to political stability. In the late 1860s the IRB control centre was in Lancashire. In 1868 the Supreme Council of the IRB, the provisional government of the Irish Republic, was restructured. The four Irish provinces: Connacht, Leinster, Ulster and Munster had representatives on the council, along with Scotland, the north and south of England and London, had representatives on the Council. Later four honorary members were co-opted. The Council elected three members to the executive. The President was chairman, the Treasurer managed recruitment and finance and the Secretary was director of operations. There were IRB Circles in every major city in England. On 23 November 1867, three Fenians, William Philip Allen, Michael O'Brian, and Michael Larkin, known as the Manchester Martyrs, were executed in Salford for their attack on a police van to release Fenians held captive earlier that year. On 13 December 1867, the Fenians exploded a bomb in attempt to free one of their members being held on remand at Clerkenwell Prison in London. The explosion damaged nearby houses, killed 12 people and caused 120 injuries. None of the prisoners escaped. The bombing was later described as the most infamous action carried out by the Fenians in Great Britain in the 19th century. It enraged the public, causing a backlash of hostility in Britain which undermined efforts to establish home rule or independence for Ireland. In Northern Ireland, Fenian is used by some as a derogatory word for Irish Catholics; in 2012, British National Party leader Nick Griffin was criticised by Unionists and Republicans for tweeting the term while attending an Ulster Covenant event at Stormont, Belfast; Griffin referred to Lambeg drums, saying "the bodran [sic] can't match the lambeg, you Fenian bastards". The term Fenian is used similarly in Scotland. During Scottish football matches it is often aimed in a sectarian manner at supporters of Celtic F.C.. Celtic has its roots in Glasgow's immigrant Catholic Irish population and the club has thus been associated with Irish nationalism, symbolised by the almost universal flying of the Irish Tricolour during matches. Other Scottish clubs that have Irish roots, such as Hibernian and Dundee United, do not have the term applied to them, however. The term is now firmly rooted within the Old Firm rivalry between Celtic and Rangers. Use of the term as a religious slur carried criminal penalties in some contexts under the Offensive Behaviour at Football and Threatening Communications (Scotland) Act 2012, before its repeal in January 2018. In Australia Fenian is used as a pejorative term for those members of the Australian Labor Party (ALP) who have Australian Republican views similar to those who support Irish unification. Michael Atkinson, Attorney-General of South Australia, spoke of those members of the ALP who wished to remove the title Queen's Counsel and other references to the crown as "Fenians and Bolsheviks" in a speech given at the ALP Convention in Adelaide on 15 October 2006. Atkinson made a further mention of Fenianism when the title of Queen's Counsel was abolished. 'The Fenian is the artist in Irish politics. He is an inspiration, an ornament, a hero.' Liam O'Flaherty, The Life of Tim Healy (1927), p. 40.
' ... the fools, the fools, the fools! They have left us our Fenian dead, and while Ireland holds these graves, Ireland unfree shall never be at peace.' Padraig Pearse's graveside oration at the reinterment of Jeremiah O'Donovan Rossa's remains in Glasnevin Cemetery in August 1915. Joseph Conrad's The Secret Agent, published in 1907 but set in 1886, takes place against the background of terrorist bombings in Britain. Although Conrad's bombers are anarchists, most critics agree the Fenian bombings are a significant part of his inspiration, especially as international anarchist terrorism in the nineteenth century had had comparatively little impact in Britain compared to the Fenian campaigns. ^ "Fenians | The Canadian Encyclopedia". www.thecanadianencyclopedia.ca. Retrieved 6 February 2019. ^ "Fianna". www.timelessmyths.com. Retrieved 6 February 2019. ^ Kennerk, Barry. Shadow of the Brotherhood: The Temple Bar Shootings. Mercier Press. ISBN 978-1-8563-5677-0. ^ "FENIAN BROTHERHOOD". IrishRepublicanHistory. Retrieved 6 February 2019. ^ "For the Sake of Ireland: The Fenian Raids of Missisquoi County 1866 & 1870". townshipsheritage.com. ^ Further reading: W. D’Arcy, The Fenian movement in the United States: 1858–1886 (New York, 1947, 1971). W.S. Neidhardt, Fenianism in North America (Pennsylvania, 1975). H. Senior, The Fenians and Canada (Toronto, 1978). D.A. Wilson, Thomas D’Arcy McGee, vol. I: passion, reason, and politics, 1825–57 (Montreal and Kingston, 2008). ^ Stanford, Jane. That Irishman. History Press Ireland. p. 33. ISBN 978-1-84588-698-1. ^ "The Project Gutenberg eBook of The Dock and the Scaffold, by Unknown". ^ Adrian Rutherford; Victoria O'Hara (2 October 2012). "BNP leader Nick Griffin faces police probe over 'fenian bastards' sectarian tweet during procession - BelfastTelegraph.co.uk". Belfast Telegraph. Retrieved 6 April 2016. ^ "BNP leader Nick Griffin defends Fenian comment on Twitter". BBC News. Northern Ireland. 30 September 2012. Retrieved 6 April 2016. ^ "Ibrox chant ruling goes to appeal". BBC News. 18 April 2006. ^ Bradley, Joseph. Fanatics! : power, identity, and fandom in football. ^ "InDaily - Adelaide News - Daily Independent News". InDaily. ^ Agathocleous, Tanya (2009). "Introduction". In Conrad, Joseph (ed.). The Secret Agent. Broadview Editions. p. 12. ISBN 978-1-55111-784-3. ^ Watts, Cedric (2007). "5.3: The Greenwich Bomb, Anarchists, Fenians and Jews". Joseph Conrad: 'The Secret Agent'. Humanities-ebooks.co.uk. ISBN 978-1-84760-135-3. P. S. O'Hegarty, A History of Ireland Under the Union, Methuen & Co. (London 1952). Leon Ó Broin, Fenian Fever: An Anglo-American Dilemma, Chatto & Windus, London, 1971, ISBN 0-7011-1749-4. Patrick Steward and Bryan McGowan, The Fenians: Irish Rebellion in the North Atlantic World, 1858-1876. Knoxville, TN: University of Tennessee Press, 2013. 'The Fenians in Context Irish Politics & Society 1848–82', Dublin: R.V.Comerford, 1985. Patrick Quinlavin and Paul Rose, 'The Fenians in England' (London, 1982). Niall Whelehan, The Dynamiters: Irish Nationalism and Political Violence in the Wider World, 1867–1900 (Cambridge, 2012). Thompson, Francis John (1940). "Fenianism and the Celtic Renaissance" (pdf). A dissertation studying the interrelation between the exponents of physical force and the literature produced in, or about, Ireland during the period between 1858 and 1916.. University of South Florida Tampa Library: New York University. pp. 1281, 5 vols. Thompson, Francis John (1936). "Francis J. Thompson Diary" (pdf). A journal of Francis Thompson research for Fenianism and the Celtic Renaissance. University of South Florida Tampa Library. p. 229. Brady, William Maziere (1883). Rome and Fenianism: The Pope's Anti-Parnellite Circular (1 ed.). London: Robert Washbourne. Wikisource has the text of the 1911 Encyclopædia Britannica article Fenians.